Chris McCann’s header on its way to rebounding off the crossbar in front of the visiting supporters. A tired-looking Wigan Athletic rode the waves of Charlton pressure in the first half to come back with a better performance after the interval. Although it was a goalless draw both sides had opportunities to win the game. In the end a draw was a fair result. Owen Coyle lost Scott Carson injured in the warmup, with Lee Nicholls stepping up. Latics took the field without a substitute goalkeeper on the bench. As expected Thomas Rogne, James Perch and James McArthur returned to the starting lineup. Ben Watson and Chris McCann occupied the central midfield positions with McArthur pushed across to the right. Nick Powell and Grant Holt made up the strike force, with James McClean on the left. 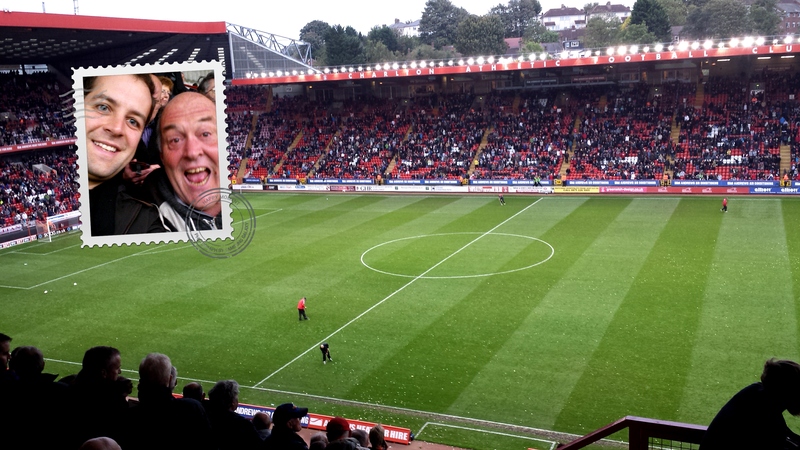 Charlton were the better team in the first half. That Latics went into the dressing room at the interval without conceding a goal was largely down to a confident performance by Nicholls. He had shown his confidence and technique with his handling early on. His reaction save just before half time to defy big defender Richard Wood’s point blank header was top-drawer. Latics produced little of note in the first half and it looked like another away defeat was on its way. With no wide player on the right Latics’ play had been skewed and the link up play between Perch and McClean had been poor. Neither seemed to have the close control or passing ability to deal with a crowded zone on Latics’ left. Ben Watson made some uncharacteristic passing errors in midfield and McArthur’s influence was marginalized in that wider position. There was little ‘running off the ball’ so that when a defender was ready to pass the ball forward there were options open. The passing in general was poor. Latics came back after half time showing more resolve. 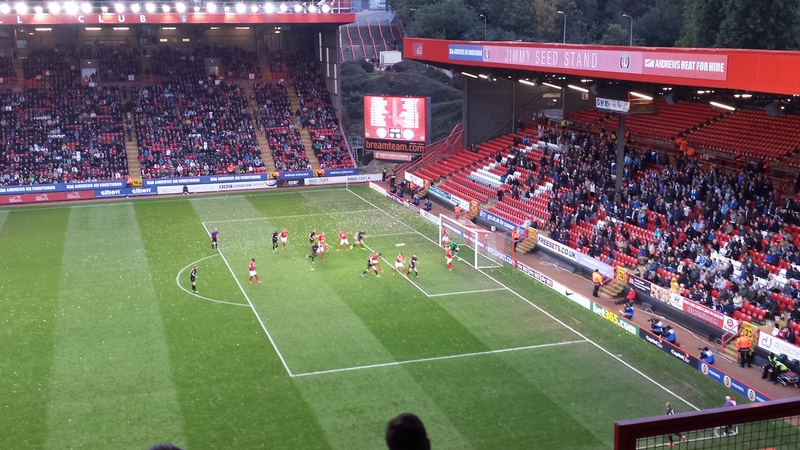 They clawed their way back into the game and made Charlton look vulnerable in a way that did not seem possible in the first half. A rocket shot from Dale Stephens went narrowly wide, but soon after McCann’s header from a corner crashed against the crossbar. McCann was the focal point of most of Latics’ better football, before they reverted to the ‘Bolton mode’ in the final third of the game. Wigan put on the pressure but Charlton were dangerous through their pace on the wings. Latics defence had to be on their toes to keep them out. Coyle had taken off an ineffective McClean for Callum McManaman after 66 minutes, then at last relieved the jaded Watson after 72 minutes. The substitute was Roger Espinoza, who provided a lift to the game with his energetic approach, although being played out of position in left midfield. Marc-Antoine Fortune replaced Holt after 76 minutes. Latics spurned the chances they had in the second half and in the end Charlton were probably grateful for a point. The run of four consecutive away defeats has been halted although the goalless streak on the road now stretches to five matches. The second half display was full of effort and endeavour and Latics pushed forward creating opportunities. Thomas Rogne and Leon Barnett controlled the aerial side of Charlton’s game and they continue to look like a strong partnership at the heart of the defence. They dealt well with the danger coming in from the wings. Chris McCann followed on from his fine performance against Rubin with another good display, tireless in defence and creative in attack. Around the 70th minute Coyle had both Espinoza and Fortune warming up on the sidelines, close to where we were sitting. Coyle was soon to point the finger to beckon at least one of them on. Espinoza’s body language said “Who me?”, probably assuming it was the big forward who was to go on. The Honduran did go on, with Fortune following four minutes later. Espinoza was given a chance at last, if not in his best position. Once more we had a tactical change from Coyle. This time he chose to play with one wide player, McClean. Key central midfielder McArthur was pushed out to the right, like a fish out of water. A better option would have been to rest the jaded Watson and play the Scot in his normal role, with the deserving McCann alongside. The left flank play between Perch and McClean in the first half was inept. The full back’s passing was dire and the winger’s control poor. In the final third of the match it once again it looked like we were watching a Bolton game. A waste of the talent in midfield and in Nick Powell who received poor service. It is becoming a depressing trend. Coyle deserves to be commended for the spirit he has imbibed in his players. However, question marks remain about his tactical approach. Lee Nicholls: 7 – a composed performance from the rookie. Has a bright future ahead. Emmerson Boyce: 7 – played a captain’s role. Solid in defence and provided good support for the attack. Leon Barnett: 8 – a powerhouse performance. Plays well with Rogne. Thomas Rogne: 8 – negated the home team’s aerial approach. Totally dominant in the air and calm and calculating in his covering. James Perch: 4 – woeful in his passing and found wanting in defence. Chris McCann: 7 – another good performance from the cultured Irishman. Ben Watson: 5 – not up to his usual level. James McArthur: 5 – clearly did not enjoy being played out of position. Grant Holt: 5 – ineffective, although to be fair he received not one decent cross during the whole game. Nick Powell: 7 – cannot be faulted for effort. Spent too much time jumping for high balls. What a waste of such a talented player. James McClean: 4 – poor. Taken off after 66 minutes. Marc-Antoine Fortune: – showed a better touch when coming on for Holt. Should he be the starter and Holt the impact substitute? Callum McManaman: – unable to breach the opposition defence. Roger Espinoza: – not at his best in left midfield, but at least provided some much needed energy into the play. Had a lot of support from Latics’ traveling fans. Photo courtesy of Nathan Peters.